The SR10M7030WW Vacuum is only 9.7cm high allowing it to fit underneath furniture more easily to clean with real suction power.Wi Fi Connectivity allows you control your POWERbot remotely and clean while you are out of home. Just connect your POWERbot through the Smart Home app and set up a daily cleaning schedule for your POWERbot. It has some additional options like Corner Clean Master, Wi Fi Smart Home Connectivity, Cyclone Force Chamber System, Remote Control Included and Li Ion Battery. The Samsung SR10M7030WW Vacuum was added to the Vacuums category in May 2017. 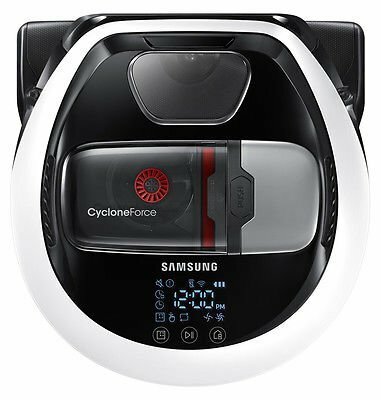 The lowest price GetPrice has found for the Samsung SR10M7030WW Vacuum in Australia is $619.00 from Appliances Online. Other merchants who stock it are Appliances Online, ozappliances.com.au, R.T.Edwards QLD.